While people may be well aware of Botox’s most common uses, it can also be used to treat a number of other issues – both aesthetic and non-aesthetic – that many experience in their day-to-day lives. My team and I strive to educate patients on the full range of treatments we offer that, when combined, provide a holistic approach to improving skin health. 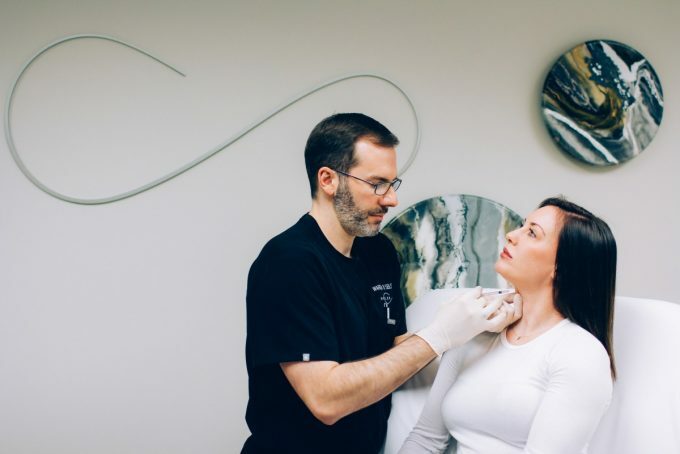 Every patient deserves to understand fully what can be done to achieve their skin goals, which is why I want to take the time to discuss how Botox can be used to treat both the neck and jaw. Now you may be thinking: the neck and jaw, is he serious? It may sound odd, but I guarantee it’s a treatment worth looking into! Many people only think about directly treating the upper face when it comes to diminishing and improving the natural signs of aging. However, you must remember that skin care requires a holistic approach, which is where the neck and jaw come into play. From eating to talking to even laughing and exercising, we utilize our neck and jaw muscles on a daily basis. The constant contracting of these muscles over time gradually produces “neck banding,” AKA laxity in the neck and jaw-line area. This causes the skin on these areas of the body to sag more, as well as to develop fine lines and wrinkles. Constant muscle contraction also “pulls” at the face, resulting in an overall less youthful appearance. There is no way we can go about our daily lives without utilizing our neck and jaw muscles, which is why Botox is a great treatment for addressing all of the conditions listed above and more. Botox works by relaxing muscle movement to reduce the frequency and severity of skin laxity and fine line development. I carefully inject the neck and jaw with Botox so that the muscles are still able to contract, but in a way that does not result in as great a level of skin laxity. This not only produces a smoother, more youthful looking neck, but can also feminize the jawline for women who may experience a “masculinizing” of the jaw over time from stress, strenuous exercise, and even normal face/neck expressions. Botox injections also help address a number of non-aesthetic issues people may experience, such as pain and headaches caused by constant grinding/clenching of the jaw. Botox continues to be one of the most popular treatments in our industry, but the ways in which it is being used are constantly evolving. More and more, patients are discovering just how beneficial Botox can be to their overall skin health and the role it can play in transforming one’s life. Whether you’ve been a Seiler Skin patient for years or want to make skin health a priority for the new year, you should consider the use of Botox on areas of the body previously left untreated to realize fully your skin goals. My conservative yet effective approach to injectables ensures that you still will maintain full functionality of all muscles while also achieving noticeable results in the treated areas. If you are interested in learning about how you can benefit from Botox in the neck/jaw, call us at 205-870-0204 or book an appointment today!